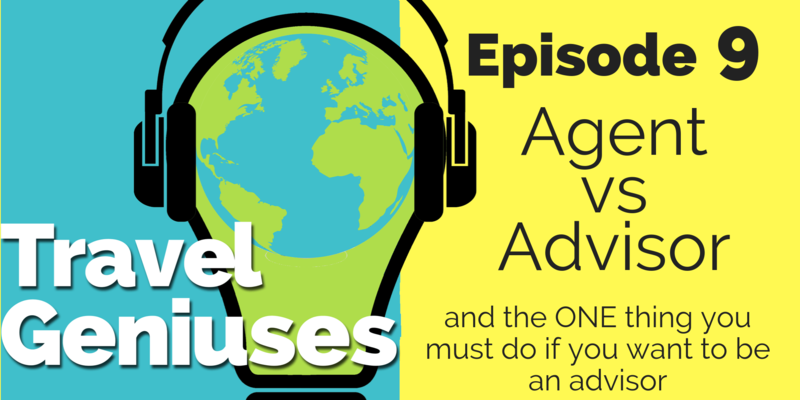 In this episode we talk about the age old debate – should we call ourselves travel agents, or travel advisors? Are you already doing this? Or are you just getting started? Do you have any other questions that help you get to the heart of what your clients want on their vacation? Which are your favorites? In this episode we’re going to talk about what we call ourselves and ASTA just had their convention a few weeks ago and changed their name from the American Society of Travel Agents to the American Society of Travel Advisors. And I know there’s been a lot of discussion online and this isn’t a new thing. I’ve heard this discussion over and over again for years on whether or not we should call ourselves travel agents, or travel advisors, or travel professionals, or travel consultants, or whatever, vacation wizards. It doesn’t matter. There’s all this debate on what we should call ourselves now. I have an opinion on that, but ultimately I don’t think it’s that important. I do have reasons for my opinion. And I think obviously it wouldn’t be my opinion if I didn’t think it was a better choice, but ultimately I don’t think it matters a whole lot. Well, let me just tell you what my opinion is. My opinion is that we should just call ourselves travel agents. I think by adding or changing it to travel advisor, or consultant, or whatever… I think it just muddies the water too much and confuses consumers. We have a hard enough time convincing people that there still are travel agents and that they can get help with their vacations, without changing what we call ourselves and confusing people. If a real estate agent suddenly decided to call themselves… if you met somebody somewhere and said, “Oh, what do you do?” when they said, “I’m a real estate advisor.” Would you even think that that was somebody you could work with? I wouldn’t. I would assume that they advise investors or a commercial property buyers, and I would never in a million years think that that was just a real estate agent that would help me find a house or sell a house if I needed to do that. I think we run that risk of confusing people in the same way. If somebody asks us what we do and we say “I’m a travel advisor”, they have no way of knowing that you are the person that they know of as a travel agent who helps people plan vacations. They may think that you work in corporate travel or maybe you advise travel companies. What does that even mean outside of the industry? It’s not really a term that people hear, so I think it just confuses people and I don’t think it makes it clear what we really do and the value we bring. The general public doesn’t care what we call ourselves. They’re not sitting around worrying whether they should work with a travel advisor or travel agent or a travel professional. All they want, if they even know that they can get help with this, all they want is a really great vacation with really unexpected and amazing experiences, and they don’t want any of the hassle of planning that. They don’t really care what we call ourselves. That’s just what they’re looking for. And if they go onto google, and try to find somebody to help them with a vacation, they are not going to search for a travel advisor. They are going to be searching for a travel agent in their area. So that’s another reason, not just the general public perception and confusing them, but also being able to be found in Google search, which is a whole other topic. I’m not going to get into SEO right now, but just trust me that in your website copy you want to use the words that people are going to be looking for when they type something into Google search and I would bet money that very few people are searching for a travel advisor. Now here’s part two of this podcast episode where I talk about what we should be doing instead of worrying about what we’re called. We need to behave like advisors. We can’t magically change how people perceive us and perceive our job just by changing our job title. We can only do that by being what we want people to expect from us. So if we want people to think that we’re advisors, and professionals, and consultants, we have to behave like advisors, and professionals, and consultants. You doing that yourself and I’ll explain how in a little bit, but you doing that yourself may not feel like a big deal. Like “Why should I bother because I can only change the perception of a few people?” But if enough of us do this, eventually the word will get out and people’s perception of what a travel agent is will change. And actually, I think that that’s probably changing already, and I would even argue that it’s not necessarily the public’s perception of us that needs to change. It’s our perception of us that needs to change, and maybe even some of our supplier partners as well. I don’t think the public is consciously, in their head, thinking, “Ooh, a travel agent. All they do is book airline tickets and book cruises.” I think they know and have an idea that a travel agent helps with a vacation. They may not know to the extent, but the way we change that is by doing all of that stuff. Advising people and consulting them and helping them plan the best vacation, not just taking orders and making reservations. And Gosh, I get so serious when I’m talking about all this stuff. I have been side note here. I have been recording myself with video while I’m doing these podcasts because I’m trying to work up the nerve to do some Facebook lives or do some sort of video, maybe Instagram stories, and it’s just like… Some of you may have experienced this as well, but just like what the podcast, nobody likes to hear themselves talk. You don’t sound like you think you sound when you play it back. So in order for me to get ready to do this podcast, I was recording fake podcast episodes a lot until I started to not hate it so much. So that’s what I’m doing with the video. And I’ve realized I think I look horrible, especially when I’m not smiling. So I keep trying to remember to smile while I’m talking, but it gets so intense, and I forget So I’m going to switch gears and try to remember to smile. I’m going to share with you some ways, or a way, that you can start actually being an advisor and changing, one vacation at a time, the way people think of us and what they think we do now. I remember seeing a few polls years ago that talked about why people use travel agents and why they sometimes switched from one agent to another – left the agent they were working with and went with somebody else. One of those reasons, and one of the things that kept popping up was that they wanted advice. They wanted the travel agent to make suggestions. That’s why they used a travel agent and maybe one wasn’t doing that. So they switched to another that would do that for them. And I tried really hard to find these articles and I can’t find them anywhere. It’s maybe even been 10 years ago. I don’t remember if I ever find them, I will let you know. But trust me, I remember reading these and I remember thinking that it probably was not something that I was doing because I was really unsure of myself and insecure and worried about losing a booking if they came to me and said they wanted a Royal Caribbean cruise. I was afraid that if I suggested something else, or told them maybe what they wanted wasn’t the right thing for them, that they would leave and go book with another agent. Which in hindsight sounds really silly, but that’s what I felt. But really the whole reason they were coming to me as an agent is because they wanted my expert opinion. Especially now if somebody just wants somebody to make the bookings – to call the cruise line and make the reservation, that’s something they can do on their own. And yes, there are things that we do to help with that process. We can stay on top of things, and make sure details don’t fall through the cracks, and be there to help if something happens while they’re on vacation. But for the most part, that’s not something they need somebody else to do for them. The Internet exists now, they can very easily go on the cruise line website and book the reservation themselves. So the real reason they would come to a travel agent, and the real value we bring, is with our knowledge, and our input, and our advice, and our suggestions for their trip. A lot of people hate those days. I happen to love them because I have a good memory for that kind of thing. So when I hear something that a hotel is doing that’s different and unique, I sort of file that away in my brain and then later, if I have a client that that would be really great fit for, I know where to send them. Your clients don’t have access to any of that information, so all they know is what they’ve been able to glean from maybe some internet searches, or maybe a recommendation from a friend, or something they’ve seen on TV. So we all know that Royal Caribbean and Carnival and Viking – they’re advertising all the time. But smaller companies, like Uncruise, don’t have those marketing budgets to advertise. So that may be a better fit for your client, but they don’t know about it because they only know what they know. They only know what they see on TV, or what their friends tell them, or what they happen to find in an internet search. And please know that even if you’re really good at searching the internet, it doesn’t mean that other people are. I take it for granted because – I call Google my husband sometimes because I can google anything and find the answer to whatever and I’ve repaired appliances and fixed my car and all kinds of stuff with a google search. But my sister calls me all the time because she’s just spent two hours trying to find something and can’t figure it out. And I, while I’m on the phone with her, do a quick google search and give it to her in 30 seconds. And she just can’t understand how I do that. So know that just because all these extra things are just a quick google search away., your clients maybe aren’t able to find those. So just because they come to you and say, “I want to go on a Royal Caribbean cruise and this is the itinerary that I want and these are the dates I want to go. And this is the cabin I want.” It doesn’t mean that that’s necessarily the best option for them. It could just be that that’s all I know. It’s your job to ask them questions and make sure. Maybe that Royal Caribbean cruise is the one for them. Maybe it is the right choice, but it’s really important to ask them questions to find out what… especially if this is a new client, but even if it’s an existing client that you’ve worked with a lot… sometimes what they want for one vacation is not what they want for the other. So find out what they want from that vacation. Do they want something exciting and new and different or something relaxing and chill and what exactly does that mean to them? One person’s version of relaxing is not the same as somebody else’s version of what relaxing is. I was in one of my facebook groups the other day and somebody said, “I’m looking for someplace to go for my husband and I’s 10th anniversary. Where should I go?” And people started throwing out all kinds of stuff. Iceland, Hawaii, a European cruise. Not One person asked them, what do you like to do? Do you like to hike? Do you want to hang out on the beach? Do you want some great entertainment and shopping and food? You know, one person’s perfect, romantic getaway is not the same as somebody else’s. And the things that were suggested were wildly different, but you wouldn’t know unless you talk to the person, asking what is right for them. So that’s what I’m getting at here. You can’t be an advisor just by saying you’re an advisor. You have to actually advise people and the best way to do that, or the only way to do that well, is to talk to them and ask probing questions so that what you’re advising them about is really the best fit for them. Here’s what that looks like. If somebody comes to you and they know exactly what they want, they know the destination, they know the resort, they know their dates, all of that. It’s all planned out. Or even if they just say, hey, I want to go to Hawaii for Christmas vacation, the first thing you need to do is ask why they chose that. See if there’s a compelling reason already and they’ve already thought it out and maybe that is a good fit, but find out why. Why did they choose that destination or that ship and that vacation and that date and that specific resort. All of that. Then ask them what their typical vacation habits are and what they want out of this trip. What do they like to do when they travel? Are they active? Are they shopping? Are they eating at fancy restaurants or do they prefer to go more local? Do they want American style hotels or do they want to know that they’re in the destination and want something really local and authentic? Do they like shopping? Do they need nightlife? Do they just want to hang out on the beach all day or go out site seeing? Do they want a huge resort with lots of amenities and different restaurant options, or would they prefer something small and boutique, that maybe doesn’t have any restaurants on site but has more of a family feel, the staff gets to know their names, things like that? So it’s just really important to ask a lot of probing questions, find out what they want, what their idea of a vacation is, and what it is they want out of this specific vacation. Because just because they have a typical style when they usually go, doesn’t mean that maybe this particular vacation, they’re just looking for something different. And if you’re asking these questions, especially if this is a new client to you and you haven’t worked with them before, this is a great way to differentiate yourself from maybe another agent if they’ve called another agent, if they’re just calling to get price quotes or things. And don’t let this overwhelm you. I know it sounds like I’m asking you to do a lot. But if you figured out your niche and you know who you want to help and the type of person that usually comes to you, you’ll start to learn which questions will help you get to the heart of things faster, and what things you need to know in order to make the best recommendation. I’ve been trying really hard to make sure I’m giving you something actionable with each of these episodes and not just throwing a bunch of theory and ideas at you that you can’t act on or not telling you how you can act on them, and I also don’t want to give you too many things to do in each episode so that you’re just feeling overwhelmed and that I’m just giving you too many things and you don’t do anything with it. I really want to be giving you things that are actionable that you can actually do that are easy, that will help move your business forward. Today is no different. What I’ve done is created a pdf that you can download. It’s just one sheet with some questions that you can start with and are just suggestions to get you started. You’ll want to add and subtract and make it your own to fit your niche and the type of people you work with. And then just practice so the next time you get a vacation request, instead of jumping right to the booking process and booking what they said they want, ask a few of these questions and make some suggestions based on their answers. Don’t make a ton of suggestions. Give them two or three at the most, and the more you do this, the easier it will be and the more valuable you’ll be your clients. When you start making suggestions that they hadn’t thought of and giving them reasons for those, they’ll start to be scared to book a vacation without your input after that. So I think it’ll make a big difference in your business if you aren’t already doing this. And that’s it, you guys. That’s it for this episode. I really do hope you found it helpful. I know learning this made a big difference for me in my confidence, honestly, in my vacation planning because I realized that people wanted my opinion and that’s why they came to me. So it became much easier and less intimidating to make suggestions to people about where they should go and what they should do. So I hope you found this useful. I’m not going to tell you what the next episode is about because I don’t know yet. I’m working on a few interviews, so, I don’t want to promise something and not be able to get it done in time. There will be another episode that I can promise you. If you’re enjoying the podcast, please share it with your travel agent friends. They’d love to reach more agents. And as always, if you have any suggestions, shoot me an email at christy@travelgeniuses.com. I always love hearing from you. Until next time, have a great week.